That reasoning actually paid off. I’ve got a story for you (how unusual, I know, me? a story? 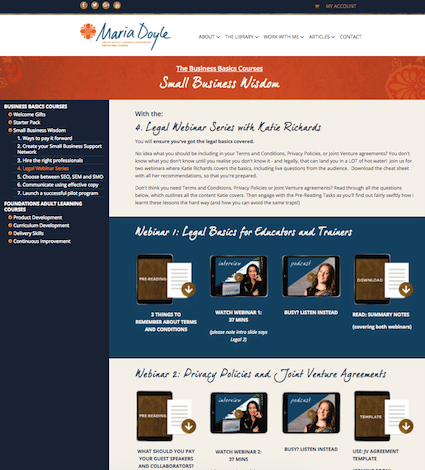 ), and it’s inspired a legal webinar series with Brisbane lawyer Katie Richards, of Virtual Legal, who is making waves in the legal world of small business. If you’re keen to get the low down on what YOU need to know as a small business owner, join us for the quick tips and the webinar below. In the lesson, there are also summary notes which list of all the recommendations Katie makes about your Terms and Conditions and your Privacy Policies, and what you need to remember to include. If you’d like to find out more about what lead me to share her knowledge with all of you, read on. There are 3 distinct lessons I learnt from this experience – and I’m hoping they can help YOU avoid any unnecessary, avoidable drama! I had a lovely potential client call me and talk for over half an hour about how fabulous my course sounded, how fabulous my mission and vision was, and essentially pumped me for every bit of ‘free’ information she could possibly get out of me. In good faith, and because the primary reason I do what I do is to help people, I obliged. A week later she bought my course. A week after that, she complained of a number of things not working (which we researched on various machines, browsers, locations and ISPs and found to be working perfectly), and my team worked around the clock to give her new log in details, send personalised video instructions for logging in and accessing content (which had been accessed by loads of other clients without any issues, and clearly wasn’t rocket science but in an effort to be super helpful we obliged). When the complaints continued (which we couldn’t verify on any machine, browser or operating system), I spent my Saturday night trying to help troubleshoot the hardware, suggesting that she clear caches and update browsers, restart modems, and even after all that, she told us she had a ‘three strike rule’ and demanded a refund. When I pointed her to the Terms and Conditions that she bought the course under (once the content has been accessed, there’s a no refund policy unless it is a breach of Australian Consumer Law), she CCed her lawyer in and proceeded to ask for a chargeback through PayPal. Bottom line, she has accessed the content, which is in perfect working order and has glowing testimonials galore, and now she wants her money back. Not because it’s bad content, not what was promised, or not working, just because. The real implication of this though, is that I was reported as providing a fraudulent service, and the fees she paid, wereheld pending investigation. I provided extensive evidence to PayPal including evidence that she had accessed the content, and emails where she admitted doing so, even though the reason for the fraudulent claims was that she ‘could not access the course’. The reason I’m telling you this story is not to have a whinge, sully anyone’s name, or cry POOR ME! I run a small business online, and being open to these kinds of incidents is simply part of the landscape. What PayPal eventually decided, would have to be the final answer as we all know that a sole operator fighting a giant like PayPal over what is right and wrong when it comes to a $595 course, would be completely futile. What intrigued me though, is whether the row my ducks were in, was straight enough. I have solid Terms and Conditions, and a solid product. Would that be enough though? Aaaaaand we got an answer from PayPal. BOO-YEH! Justice prevailed. So there’s a good reason I’m sharing this story. If I can help others avoid what I had to go through (not knowing whether what I had was good enough, not knowing whether the system would fail me) by writing this post, then my job is done. 1) Have solid Terms and Conditions written up by a lawyer who understands online trading and small business. I wasted $6000 with my first lawyer who was recommended by an accountant who worked out of the same building. Trust a lawyer who KNOWS the business you’re in, inside out. My second set are brilliant – and cost a fraction of that, thanks to a lawyer who knows small business inside out, because she’s running one herself. 2) Keep all evidence of discussions, emails and transactions. You may be called on to provide them. If a client starts to make ripples, be prepared for a tidal wave – take screen shots of all user activity and related correspondence, as soon as you get an inkling there may be an issue. 3) Have a clear picture in your mind of how YOU would deal with a situation like this – is it easier to for-go the drama, and just refund straight away? Is it worth the hours of back and forth emails, chargebacks through PayPal, dealing with the bad ju-ju that inevitably comes along with a client like this? Know where you stand, and be prepared to take that stand when the time comes. Now for those of you who answered ‘just give them a refund’ to the third ‘lesson’, I have a question for you. When I approached a number of business forums and asked what to do in this situation (refund? partial refund? or stand your ground and use your T&Cs?) I was mostly recommended to give her a refund and not waste anymore time on her, or her baseless claims; that the time it would take me to ‘fight’ for justice, would far outweigh the money I’d be refunding her, so to take the moral high ground, get her out of my ‘space’ and give her the money back. Is that your take on it too? Are we, as small business owners, creating a massive problem for ourselves by simply caving in? Fancy hearing a lawyer’s take on this, and finding out the bare minimum you need to have in your Terms and Conditions? The #clientnamewithheldforthesakeofintegrity affair has resulted in me approaching my lawyer, to do a series of public webinars on legal issues that affect those who are in the world of educating and training in the small business world, including things like Privacy Policies, Professional Indemnity Insurance, Terms and Conditions, and Joint Venture agreements. Introducing, the phenomenal Katie Richards, of Virtual Legal. Wait till you meet her. She’s one of those women who operates from a place of true service, and is an absolute mine field of information, inspiration and integrity. what should be included for online products and services? is there a one size fits all model? do the terms and conditions have to be on the page where they buy? should they have to tick a box before buying to say they’ve read them? what happens when a client purchases a service then doesn’t want to use it? International clientswhat law do we operate under? Theirs or ours? can they sue us from abroad? what do I need to know about working with other professionals when I’m creating content or communities? do I need a legal document if we’re creating something together? what do I need to make sure is clear with my Joint Venture Partner before we start working together? Ready to find out the low down on all the points above? We’ve prepared a Legal Webinar Series that covers all the questions above. Two interviews, and summary notes that cover everything we discuss during the interviews, which were specifically created to address the problems that my clients have had. Together, we decided we could save more hard working small business owners from falling into the same traps we have! ← Top 5 tips for making engaging, motivating instructional videos (with ease). Such great timing for me! Our universes must be aligning. Looking forward to this webinar series 🙂 Love that you’ve used this adversity to create something meaningful that will help others. My opinion for online eCourses is to offer a money back guarantee for a set time period, depending on the overall length of the course. That gives unsure people an out if they want to take it. In return of the money back policy you would need to make sure the core lessons are fixed to the site if you release all content once the customer pays. If you use video you can do this with Wistia, and make the downloads you do offer homework on the video lesson. Which means if someone pays, downloads what’s available, and asks for a refund within that time frame, what they do have is missing big holes without the actual context of the lesson. The loophole here is audio downloads of the video lesson, and this comes down to your own discretion if you offer it for your audio learners or not. Statically speaking, those that ask for refunds are a very small minority if you have marketed correctly and produced top notch content (not saying you haven’t, some people just like refunds), so providing the audio would be ok. If you release content module by module then I would offer everything within that module for download and if they take the first two modules and then get a refund, good on them, the only person they are harming is themselves. Make sure the juicy content that everyone wants is after the refund period. + By protesting her refund you’re not helping her for the better of “this is work that will help you”, you’re causing her to dig her heels into her old patterns. As time passes and nothing changes for her, she will come to realise the responsibility is in her hands. Of course each case is different, and if you start to see an influx of refund requests then work out what’s going wrong in the process, and stand strong on your T&C’s, because yes you are a small business, and yes strong T&C’s will help you. I’m sure you know most of this, but for those reading this comment and wondering if there are ways around the black and white refund or no refund options, yes, there are other ways. At the end of the day, your happiness is what matters most. Hi Phoebe, thanks for this! Totally hear what you’re saying on all counts – but the course is evergreen, so once you’re in, you have access to everything, so great points about refunding but unfortunately doesn’t apply to my situation. The activity books are also knitted together so within 4 downloads, you have over 120 pages of goodness – which is the basis of the whole course – all other resources (video, audio, PDFs, slides etc) support the work that is done in the workbooks so again, once you’re in, you have access to the whole shebang and refunding someone who essentially has been able to download all the content doesn’t really seem fair. The videos are embedded in a wistia-esque fashion so not so easy to download but otherwise once you’re in, you’ve got it all. It’s a rabbit warren of possibilities this online learning and teaching game – isn’t it? I definitely agree on the energy vs money outlay vs time conundrum – but in saying that, if you allow people like this to get away with it, I’m struggling to see the reason why you’d outlay the time and money to have solid, legally binding terms and conditions written up in the first place. One has to be very careful and I believe having a water tight refund policy is important. I’ll be signing up for your webinar too. I haven’t even contemplated what I’d do if/when that sort of situation arises. Sorry you had to go through that. Luckily those sorts of people are in the minority but clearly vigilance is still required by all of us. My thoughts would be.. if it’s about $500 or so, It’s very unlikley the client would be going to a lawyer as it wouldn’t be worth their while financially – unless they had a serious bee in their bonnet. So I’d like to think I’d still refer the client to the terms and conditions and leave it at that. Probably easier said than done however, as she/he may proceed to cause you reputational damage if you don’t comply with her/his refund request. It’s a tough one Maria! The Paypal outcome will be interesting..
Hi Maria, this is a great post and i love that you can be grateful to this person for the lesson. Ordinarily, if this was a client’s customer who was genuinely upset with a product or service i would tell them to see that unhappy client as a blessing too, because if the complaint is genuine they are giving you feedback that you can use to improve things AND they are giving you an amazing opportunity to demonstrate your ‘unfrickin-believable, i have to tell everyone how awesome that was’ customer service. An unhappy client you turn around is even more likely to become you best brand amabassedor than a happy client. However, this is a very different case. It sounds like this person knew what they were doing from the start, they knew you had gems of knowledge they wanted, but they were never willing to pay for it. This person is never going to be a brand amabassedor because the onky way they will be satisfied is if they get your product for free, and even then, once they have a refund now they can’t go telling people how good it is, they have to maintain it was rubbish. Not giving her a refund in this situation is standing by the quality of your product. Thanks Aerin – I whole heartedly agree! Woot woot! Is there a standard set of terms and conditions that can serve small-number (participants and cost) online courses, with tweaks if needed, or must it be fully customised for each situation? When we are operating in an international sphere, which country laws must we satisfy – where course is sold, or purchased? Awesome questions – keep them coming! Sorry to hear. I had my very first request just the other day. I am to reply today. Thanks for sharing this it will definitely help in my response, which will be (denied) our terms and conditions in our contract are very tight and our client used the documents provided to gain compliance with the ministry but insists on running a unlawful business. The client can’t understand why NZ government won’t change the law to suit there service. Sorry to hear that Lyla! Yep, stand your ground! Email comment that just came in – promising information to hear! ‘I fully support you upholding your terms and conditions on this one. I have been in your shoes a few times. I have had customers asking for refunds … and when it has escalated to Paypal dispute I have won every time. Which begs the question – do we, as business owners, need to have plug ins installed so that we can actually see how long a client has been logged in, which documents they have downloaded, to prove to PayPal that the content has been accessed? My back end tells me how many times a user has logged in but little else – sounds like it might be worth the investment if PayPal doesn’t accept the evidence that the user name in question has logged in! Great article, and look forward to the webinar series. This is a real issue for small business owners particularly those of us who have online presence – and use paypal. There is no one answer to this question because it depends on what you’re goal is. If you want to be treated fairly and see this as unfair treatment then pursue it. It has made me question whether using Paypal is a good idea even if you have terms and conditions. Thank you for sharing this story – not an easy thing to do and also for being willing to care enough that we don’t go through the same. I hope you get resolution. Wishing you success – in whatever way you define it. Agreed Ro! thanks for the support! Here’s my answer…. REFUND and moooove on to better vibes. There are always going to be whinges and scammers out there in the world and you can times that by 10 when there is a screen or phone to hide behind. You know in your heart you did the right thing. She knows in her heart if she is doing the right thing. From a service point of view it’s always be best to be squeaky clean and the customer is always right (even when they are wrong) this shuts them up and moves them on with as little fuss as possible. But and here’s my but…. From a sales point of view you should always have more juicy goodness to offer clients in another form and she is no longer able to access that, no more newsletters, webinar and certainly no more products and services. Also, feel free to let people in your circle her name so that we are all aware of the potential issues coming our way if she is to buy their stuff. Great advice Gab, and I totally understand the point of view – but this is exactly the point I’m making about these people doing this and continually getting away with it; if we continue to allow it, what’s the point of having Terms and Conditions? Is there any? Interesting discussion – thanks for responding! Great post Maria. And no I don’t believe you should cave. I think you should fight. You’ve got clear terms and conditions so you have done nothing wrong. What you said is correct – “what’s the point of having Terms and Conditions? Is there any?” Put them to use and stand by them! You had me at Chargeback. I had a client who wanted the world in a handbasket like this one. He first went through paypal and lost but then he did something else and won. He got the work and I am left owing Paypal over $600. 3. I KNEW he was THAT sort of person I JUST KNEW IT, did you really not know (and this isnt meant in any way to hold you to account, please believe me) but thining back on it, I know who I will not deal with now. 4. You went the extra 100 miles for her, you shouldnt have. They eat it up. Thanks Dianne, yep, the world is made up of a lot of interesting characters – sorry to hear you’ve met one of the more special ones too! I don’t know what I don’t know in this area so it’s a challenge to think of specific questions… but I guess I’d want to know what type of legal agreement would be most appropriate for a hybrid program (part online course materials, part consulting) – should it be a checkbox type thing when they purchase, or a contract customized with their personal info and signed the regular way? If a checkbox, what’s the best way to create that from a tech point of view? Etc. I am working on my product offering and would like to know how to access value for money legal services to get my ts and cs sorted. I would like to know the key things to include in your ts and cs and what might be the gotchas! Thanks, I’m really looking forward to this. Awesome work!